Electrifying 48 Hours——First Global VR Hackathon China Preliminaries Recruitment Start! Global VR Hackathon Recruitment Start! The Global VR Hackathon-Chinese preliminaries is an international events launched by worldwide collaborated developer communities. This is a new and exciting challenge to VRCORE and all the other worldwide developer communities. From June 23th to 25, Hackathon will be hosted in multiple regions and countries simultaneously , to let people enjoy the experience of real-time VR development. 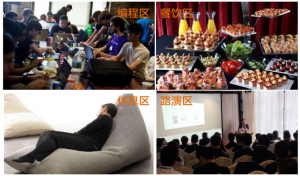 This Hackathon preliminaries will be launched at Shanghai from June 23th to 35th. Participators will be informed the topic of the development a week ahead, and build the team at the scene . The demo should be completed with 48 hours. This is not the ordinary weekend to fight by yourself, by the to gain joyful experiences with your team together. We got everything to support, are you ready for this? Although Hackathon is a professional development tournament, it is also the interest of VR fans . Good content is not only limited to techniques and technologies. As long as you got the passion on VR development, you can team up here with your people. No matter wether you are a developer, student, graphic designer or creative talents, you are free to release your creative thoughts in virtual reality world and develop the project from 0 in the teamwork. The top 3 team in this preliminaries will be qualified to enter the 2017 VRCORE Award express entry. What are you still waiting for? It’s the time to take actions. Come and challenge your limits with your team! You can decide your own design and gain great fun from your creation! Comprehensive upgrading！2017VRCORE Awards is Getting Launched! Launching a tournament at night? This is VRCORE !